Early bird advance tickets ONLY $10. 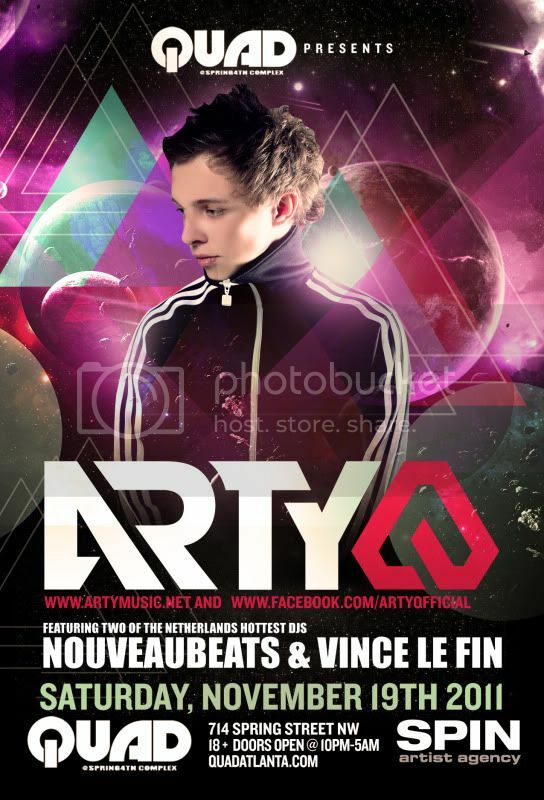 On July 4th, 2011, Arty released his massive, big-room house anthem “Around the World" on Anjunabeats following unprecedented support across the board from Axwell, Chuckie, Hardwell, Tiesto, Robbie Rivera, Armin Van Buuren, Above & Beyond, Gareth Emery and an extended list of the biggest names in electronic music of the moment on the biggest events of the year such as the Swedish House Mafia's performance on the main stage of the record-breaking Electric Daisy Carnival Las Vegas in June 2011. Artem Stolyarov has himself already been around the world and back having played events across the globe from the most prestigious clubs to some of the biggest festivals including Global Gathering, Gatecrasher and ASOT 500 in Den Bosch. In autumn 2010 Arty made his debut in the DJ Mag Top 100 poll as #78 in the world while being listed by many peers in the same centurion as the breakthrough artist of the year, which was subsequently followed by nomination for Best Breakthrough DJ at the 2011 IDMA awards. As Arty said in an interview in summer 2010, "I think that your goals must be difficult to achieve; reaching such goals is the most exciting thing that encourages me to develop as an artist", and with so much achieved so far in his fledgling career with over 30 releases on labels from Armada to Black Hole, topping Beatport charts and being supported on countless radio shows by other top artists this hard-working attitude indicates only more to come. In 2011 alone some of his productions such as the collaboration "Rebound" with Mat Zo have been among the most played tracks around and to add to his already-impressive remixology resumé he has been handpicked for duties on some high-profile release packages to be announced soon. Confirmed for Audiotistic Festival in LA and Electric Zoo Festival in New York as debuts in each city, the 21-year old Russian native continues relentlessly moving forward setting the bar for what constitutes a rookie year in every possible area of his career. Having a first official gig at Panama Amsterdam and a first release that turns out to be a Top 100 hit seems like a dream for lots of starting DJ/producers. Nouveaubeats (Niels Brooimans) knows exactly how this feels and came a long way since this flashy start. Like many, many others, Niels started to spin records at a very young age. While growing up, his influences and preferences started to focus and he created his own style which entails house, electro and minimal. The first release ‘Can U Handle’ turned out to be a hit success in the Dutch Mega Top 100 charts. Several successful remixes and own tracks followed! After the summer Nouveaubeats worked and performed a lot with Vince le Fin (Vincent van den Ende) a new Dutch DJ discovered by Nouveaubeats. Because of their new track and crazy sets they are getting popular all around world. From the beginning of 2011 they already performed in England, Spain, Kosovo, Albania & Singapore. They're also going to tour through the U.S.A. Their first stops will be in November 2011. New York, Wisconsin and Atlanta (QUAD!!) are the first confirmed cities but much more to come! Vince le Fin (Vincent van den Ende) started as a DJ three years ago. In his first year he played mostly deep house and tech house with the saxophonist Nicolay on Sax. Together they also played a live set with the best jazz pianist of the Netherlands Michiel Borstlap. Today Nouveaubeats & Vince Le Fin combine the styles of progressive house, tech house and electric-house in their set. Nouveaubeats & Vince le Fin are currently busy producing their own tracks and remixes. As we speak, Nouveaubeats & Vince Le Fin are working on several projects and they signed their new track at Spinnin Records. The release will be 24 October 2011. At the moment they are working on some new tracks, collabs and of course new remixes and bootlegs! JOIN US FOR THIS UP CLOSE AND PERSONAL EVENT!